Jeevan Asha is a unique school for deprived children, where learning is offered in a fun environment. Jeevan Asha Charitable Society (JACS) was started in 1999 by Mr Basil D’Souza with an Adult Literacy Programme (ALP). The ALP however took a back seat and a day care centre for children residing in slums of Thane became the focus area. JACS has designed a creative and informal learning curriculum for its nursery to strengthen the foundation of children in the age group of three and half to ten years. The children are divided into three sections – playgroup (3.5yrs to 4.5 yrs), nursery (4.5yrs to 5.5 yrs), and kindergarten (5.5 yrs to 10 yrs). The education programme of JACS follows a thematic methodology with emphasis on activities for physical, cognitive, social and emotional development. Children are motivated to pursue education and provided nutritious food with regular health check-ups and multi vitamin tonics. Events and competitions are organised for the children. Jeevan Asha ensures their children are integrated in government schools after the basic pre-primary learning. JACS, on request of parents, is considering starting its own school with informal system of education. The idea is to impart a NIOS (National Institute of Open Schooling) certificate course to the children. JACS has launched a community development programme with the help of parents and ex-students and plans to reach out to the slum pockets of Thane. They help publicise issues such as health and nutritional level of pregnant women, lactating mothers, infants and children less than six years of age. The initiative involves conducting community meetings, check-ups and health and nutrition sessions on regular basis. Jeevan Asha supports local government bodies in implementing their programmes. JACS recently revived its Adult Literacy Programme in Sai Nagar, Manpada and Dnyaneshwar Nagar areas of Thane with an aim of providing basic literacy. On an average, 30 women benefit from these programmes every week. Total income: JACS has diversified sources of income. In FY13, Rs1mn or 47% of total income was raised through foreign donors such as Amway and through Concern India Foundation. Programme expenses: Expenses totalled Rs3.9mn in FY13 with 76% (Rs2.9mn) of total expenses incurred on core programme activities. The main activity for JACS is its day care centre and community development programme (CDP). These activities demand active participation of dedicated and qualified staff at the grassroots level. JACS, thus, incurs 55% of total expenses (Rs2mn; more than two thirds of its programme expenses on salaries to retain the existing staff. Another similar-sized NGO, Asha-Kiran Shelters Foundation, which runs a shelter home and day care centre for underprivileged children incurs 42% of total expenses on salaries. 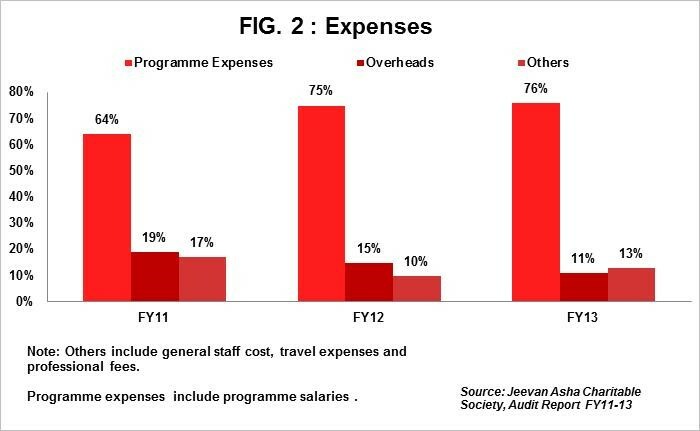 JACS’ programme expenses excluding salaries accounted for 21% (Rs0.8mn) of total expenses in FY13 (sector average: 51%). Overheads: JACS incurred 11% (Rs0.4mn) of total expenses in FY13 on overheads as against sector average of 14%. The decline in overheads from 15% (Rs0.5mn) in FY12 to 11% in FY13 could be partly because of lower expenses on printing and stationery and repairs and maintenance in FY13. This indicates efforts made by JACS to improve utilisation of funds. Fixed Assets: In FY13, fixed assets accounted for 33% (Rs0.9mn) of total assets. JACS runs the day care centre on rent and other development programmes are conducted in communities. Hence, the assets mainly comprise of computers, furniture and office equipment. Trust corpus and Investments: JACS has set aside funds to the tune of Rs1mn (61% of total funds) towards trust corpus. These funds are invested in fixed deposits to earn interest income. Investments accounted for 45% (Rs1mn) of total assets in FY13. General funds: JACS has set aside sufficient funds for general purposes. The general funds decreased from Rs1mn in FY12 to Rs0.8mn in FY13 as the deficit of Rs0.4mn in FY12 was adjusted against the general funds for that year. General funds recorded a CAGR of 14% during FY11-FY13. Income Growth Rate: JACS posted total income of Rs4mn in FY13 with a growth rate of 33% in FY13 as compared to negative growth of 9.7% in FY12. The income CAGR was 10% during FY11-FY13. Regular donors: The organisation receives regular funding from Covenant Blessings Church and Concern India Foundation. These funds are barely sufficient to run the day care centres in Thane and Orissa. Self Sufficiency ratio: The ratio for JACS is 71% in FY13. The ratio measures ability of an organisation to meet expenses from own funds. Own funds include Individual donations, interest income and membership fees. Significant portion of income for JACS comes through individual donations. Works alongside government: JACS serves as a platform for implementing government initiatives such as Anganwadi (courtyard shelters providing child nutrition) and Primary Health Clinic (PHC). 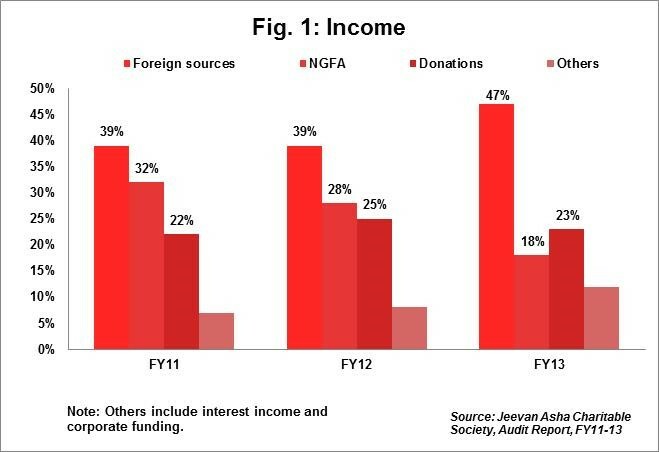 Dependence: Donations form a large source of income for JACS. As a thumb rule, dependence of 20% on single source of income is acceptable. Anything above that increases vulnerability of the organisation. However, confidence levels towards JACS have increased due to the regular CDPs held by them and has resulted in continuous support through regular donations. Funds for CDP: JACS faces the challenge of raising funds for the CDP and is looking out for corporate and government which is not yet available. So far, the CD programme is sustained with the support of donations mainly from individuals. The need for development of community is not yet a readily acceptable concept across different donor categories. Absenteeism: Though the children regularly attend schools, irregularity is observed during the time of festivals such as Diwali, Ganesh Chaturthi etc. The children avoid coming to classes because the parents are busy or they have to visit their hometown. There are seven members on board of JACS. The members belong to diverse backgrounds such as engineering, marketing and HR and are associated with reputed companies. The members have an experience of over 10 to 15 years in their respective fields and are dedicated supporters and sponsors of JACS. The Board meets six times a year.The staff undertakes quarterly community visits and interacts with parents to involve them in their child’s progress. JACS is a member of Concern India Foundation.